Generate an HDL IP core with AXI4 Master interface. 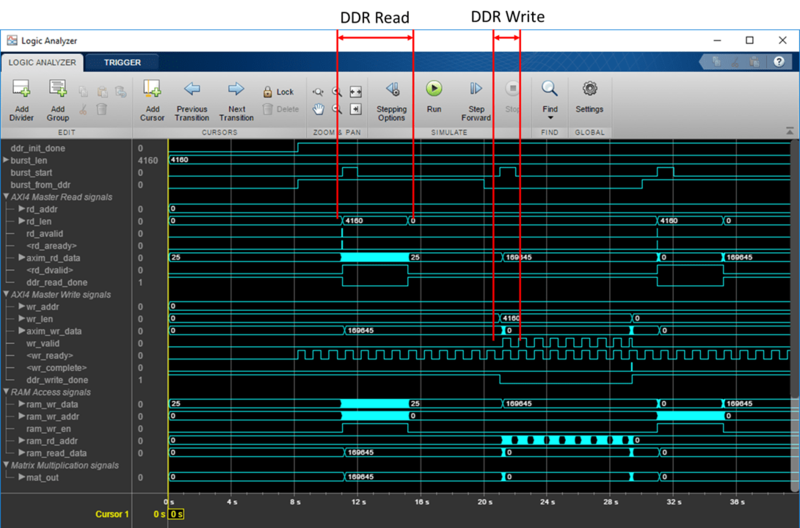 Access large matrices from the external DDR3 memory on the Xilinx Zynq ZC706 board using the AXI4 Master interface. Perform matrix vector multiplication in the HDL IP core and write the output result back to the DDR memory using the AXI4 Master interface. This example can also be run on a Xilinx Zynq Ultrascale+ MPSoC ZCU102 Evaluation Kit, to access the external DDR4 memory. This example models a matrix vector multiplication algorithm and implements the algorithm on the Xilinx Zynq FPGA board. Large matrices may not map efficiently to Block RAMs on the FPGA fabric. Instead, we can store the matrices in the external DDR memory on the FPGA board. The AXI4 Master interface can access the data by communicating with vendor-provided memory interface IP cores that interface with the DDR memory. This capability enables you to model algorithms that involve large data processing and requires high-throughput DDR access, such as matrix operations, computer vision algorithms, and so on. The matrix vector multiplication module supports fixed point matrix vector multiplication, with a configurable matrix size ranging from 2 to 4000. The size of the matrix is run-time configurable through AXI4 accessible register. This example model includes the FPGA implementable DUT (Design under test) block, the DDR functional behavior block and the test environment to drive inputs and verify the expected outputs. The DUT subsystem contains the AXI4 Master read/write controller along with the matrix vector multiplication module. Using the AXI4 Master interface, the DUT subsystem reads data from the external DDR memory, feed the data into the Matrix_Vector_Multiplication module, and then write the output data to the external DDR memory using AXI4 Master interface. The DUT module also has several parameter ports. These ports will be mapped to AXI4-Lite accessible registers, so you can adjust these parameters from MATLAB, even after you implement the design onto the FPGA. The DDR module represents the external DDR memory in simulation environment. The interface between the DUT and DDR modules are the simplified AXI4 Master protocol. One of the parameter port matrix_mul_on controls whether to run the Matrix_Vector_Multiplication module. When the input to matrix_mul_on is true, the DUT subsystem performs matrix vector multiplication as describe above. When the input to matrix_mul_on is false, the DUT subsystem perform a data loop back mode. In this mode, the DUT subsystem read data from the external DDR memory, write it into the Internal_Memory module, and then write the same data back to the external DDR memory. The data loop back mode is a simple way to verify the functionality of the AXI4 Master external DDR memory access. Inside the DUT subsystem, the DDR_Access module models the simplified AXI4 Master protocol, and use it to read and writes data on DDR. 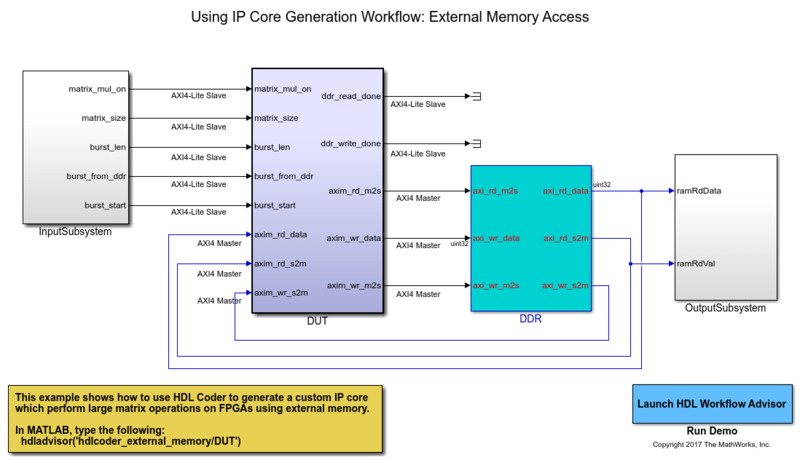 During the IP Core Generation workflow, HDL Coder will then generate the translator between the simplified AXI4 Master protocol and the actual AXI4 Master protocol in the generated HDL IP core. For more information on the simplified AXI4 Master protocol, refer to the Model Design for AXI4 Master Interface Generation documentation. Also inside the DUT subsystem, the Matrix_Vector_Multiplication module uses a multiply-add block to implement a streaming dot-product computation for the inner-product of the matrix vector multiplication. The first N values from the DDR are treated as the Nx1 size vector, followed by NxN size matrix data. First N values (vector data) are stored into a RAM. From N+1 values onwards, data is directly streamed as matrix data. Vector data will be read from the Vector_RAM in parallel. Both matrix and vector inputs are fed into the Matrix_mul_top subsystem. The first matrix output is available after N clock cycles and will be stored into output RAM. Again, vector RAM read address is reinitialized to 0 and starts reading same vector data corresponding to new matrix stream. This operation is repeated for all the rows of the matrix. The follow diagram shows the architecture of the Matrix_Vector_Multiplication module. PASSED: DDR initialization data matches. This script first initializes the parameters like Matrix_Size. By default the Matrix_Size is 64, which means a 64x64 matrix. The default Matrix_Size is kept small so the simulation is faster. After the DUT is implemented onto the FPGA board, larger Matrix_Size then can be used as the FPGA calculation is much faster. You can also adjust these parameters in the script. The script then simulates the model, and verifies the result by comparing the logged simulation result with the expected value. By default, the Matrix_Multiplication_On is true, the script verifies the matrix vector multiplication result. When the Matrix_Multiplication_On is false, the script verifies the loop back mode, which means the DUT read Burst_Length amount of data from DDR, and write the data back to DDR. If you have a DSP System Toolbox license, you can view the model signals over time using the Logic Analyzer. Next, we start the HDL Workflow Advisor and use the IP Core Generation workflow to deploy this design on the Zynq hardware. 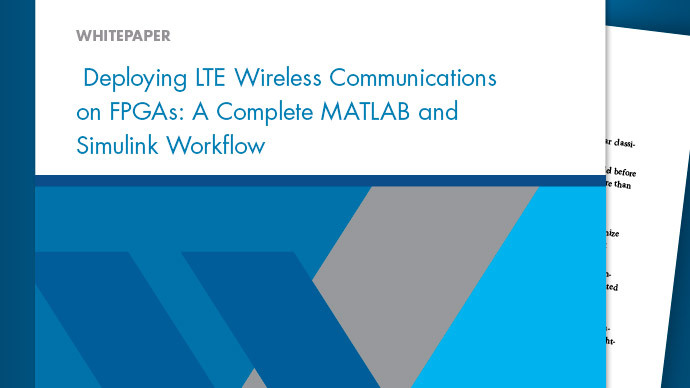 For a more detailed step-by-step guide, you can refer to the Getting Started with HW/SW Codesign Workflow for Xilinx Zynq Platform example. 2. Start the HDL Workflow Advisor from the DUT subsystem, hdlcoder_external_memory/DUT. The target interface settings are saved on the model. Notice that Target workflow is IP Core Generation, Target platform is Xilinx Zynq ZC706 evaluation kit, Reference Design is Default System with External DDR3 memory access, and Target platform interface table settings are as shown below. In this example, the input parameter ports like matrix_mul_on, matrix_size, burst_len, burst_from_ddr and burst start are mapped to the AXI4-Lite interface. HDL Coder will generate AXI4 interface accessible registers for these ports. Later, you can use MATLAB to tune these parameters at run-time when the design is running on FPGA board. The AXI4 Master interface has separate Read and Write channels. The read channel ports like axim_rd_data, axim_rd_s2m, axim_rd_m2s are mapped to AXI4 Master Read interface. The write channel ports like axim_wr_data, axim_wr_s2m, axim_wr_m2s are mapped to AXI4 Master Write interface. 4. Now Right-click Task 4.2 Build FPGA Bitstream, and select Run to Selected Task to generate the Vivado project, and then build the FPGA bitstream. During the project creation, the generated DUT IP core is integrated into the Default System with External DDR3 Memory Access reference design. This reference design comprises of a Xilinx Memory Interface Generator IP to communicate with the on-board external DDR3 memory on ZC706 platform. 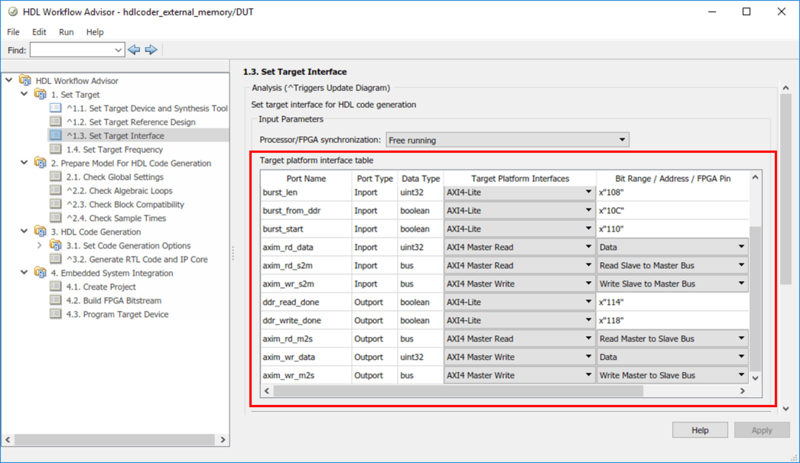 The MATLAB as AXI Master IP is also added to enable MATLAB to control the DUT IP, and to initialize and verify the DDR memory content. You can click the link in the result window in Task 4.1 "Create Project" to view the generate Vivado project. If you open the Vivado block design, the generated reference design project looks similar to this architecture diagram. After the FPGA bitstream is generated, you can run Task 4.3 Program Target Device to program the FPGA board through JTAG cable. This script first initializes the Matrix_Size to 500, which means a 500x500 matrix. You can adjust the Matrix_Size up to 4000. The AXI4 Master Read and Write channel base addresses are then configured. These addresses defines the base address that DUT reads from, and writes to external DDR memory. In this script, the DUT is reading from base address '40000000', and write to base address '50000000'. Then the MATLAB as AXI Master feature is used to initialize the external DDR3 memory with input vector and matrix data, and also clear the output DDR memory location. Then the DUT calculation is started by controlling the AXI4-Lite accessible registers. The DUT IP core first read input data from the DDR memory, perform the matrix vector multiplication, and then write the result back to the DDR memory. Finally, the output result is read back to MATLAB, and compared with the expected value. In this way, the hardware results are verified in MATLAB. 1. Use the same model hdlcoder_external_memory to access external DDR4 memory on ZCU102 using HDL Coder IP core generation workflow. 3. Now Right-click Task 4.2 Build FPGA Bitstream, and select Run to Selected Task to generate the Vivado project, and then build the FPGA bitstream. This script first initializes the Matrix_Size to 2000, which means a 2000x2000 matrix. In this script, the DUT is reading from base address '80000000', and write to base address '90000000'.